It seems that I can't stop the aging process, but I am always looking for products or combinations of products to at least slow down the signs of it. There are two areas on a woman's body that are usually more prone to showing one's true age, and those are their hands and their décolletage area. I've been using a combination treatment from Reviva Labs for the area just under my chin, down along my throat and across my upper chest that seems to be working nicely. 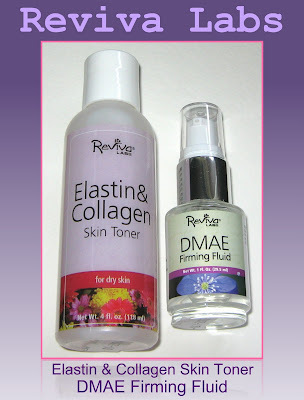 I first apply the Elastin & Collagen Toner to a cotton ball, then swipe it over the entire area. Once that dries in a minute or two, I apply just one pump of the DMAE Firming Fluid over the same area. I then apply whatever body lotion/moisturizer I'm using that day right over it. There is noticeably more firmness to the area under my chin and between my lower jaws...one of my greatest aging fears (there are a lot of them, believe me!) is that I'll develop the dreaded chicken neck, so I'm very hopeful that won't happen for a long while after seeing some results from this combo treatment. On my upper chest area, I was beginning to notice some aging signs in the form of light creases and lines. My younger, less-informed self spent many years sunning myself on the beach almost daily, which looking back now was rather excessive, to say the least. These lines and creases were only noticeable in certain lighting to me, but the fact is, it was noticeable and it needed to be addressed. Most women have been wearing a facial moisturizer for a good part of their adult life, and as they get a little older, they begin to seek out additional eye or lip-specific area moisturizers and treatments. In asking many of my friends if they used anything other than moisturizer on their throat/upper chest area, I found that not a one of them did. I know I have definitely paid far more attention to my facial area than I have to my throat/upper chest area over the years. Other than applying my facial or body moisturizer over it daily, I never gave it much thought. Elastin & Collagen Skin Toner: This is an alcohol-free toner that has a very light scent that's reminiscent of rose water to me. This has a push-to-open top. It can be used on the face as well, to refresh and tone. Ingredients: Water, Sorbitol, Polysorbate 20, Hydrolyzed Elastin, Soluble Collagen, Vitamins A & E, Natural Oil Fragrance, Potassium Sorbate, Sodium Benzoate, Citric Acid. Price: $8.00/4 fl. oz. DMAE Firming Fluid: This high-potency DMAE concentrate comes in a pump style bottle. It's a clear gel-type fluid with little to no scent. Like the Elastin & Collagen Skin toner, this product also works to firm, tone, and smooth the skin, and is recommended for use on the face and throat areas. Ingredients: Demineralized Spring Water, DMAE Bitartrate, Glycerin (Veg. ), Polysorbate 20, Sodium Chloride, Simethicone, Hydroxyethylcellulose, Potassium Sorbate, Sodium Benzoate, Citric Acid. Price: $19.00/1 fl. oz. Reviva Labs products can be purchased on their site, and at a variety of health food stores such as Whole Foods, as well as beauty supply stores such as Ulta. Reviva Labs uses natural ingredients and does not test on animals. *Products featured were furnished for review by the manufacturer or PR firm.